There has been snow. Thanksgiving leftovers are gone. The Rockefeller Tree is lit. As *NSync would say, I guess it’s Christmas time. Inevitably, along with the expected cheer and good tidings, a bit of gift anxiety usually follows. I always plan on saving money from October and November to put toward the gift fund in December, but things always come up. Like unplanned trips, concerts, and Seamless. But this year Isela Phelps has me covered. In her book, Loom Knitting Socks I found easy-to-follow instructions as well as helpful photos and diagrams. There’s even a Socks 101 section for those of us entering unknown territory. Because of Isela’s excellent tips and guidance, today’s FREE PROJECT is for all sock makers—no matter the experience level. These braid cable socks will be perfect for the cold weather months ahead. Choose a plain yarn for the cable to show best. Although these deep red socks look magnificent, it wouldn’t surprise me if my loved ones received a pair in every shade of the rainbow. As the wise Albus Dumbledore once said, “One can never have enough socks.” Well said, sir. Along with the braid cable socks you’ll find other thick socks perfect for winter (some even with snowflakes) and even breathable socks perfect for playing sports. Altogether there are fifty projects in Loom Knitting Socks—and none require a needle! Once you’ve learned the loom basics and a sock’s knitted anatomy check out one of seven sock sections (say that 5 times fast): Simple Socks, Textured Socks, Colorwork Socks, Fancy Cables and Beads Socks, Lace Socks, Kids Socks, and even Footsies—describing other foot coverings that can be used for pedicures and yoga class. Come back on Sunday to learn how you can enter to win a copy of Loom Knitting Socks this week! If you loved Friday’s free project from Isela Phelps’s Loom Knitting Afghans, we’ve got another treat for you: A chance to win the whole book! 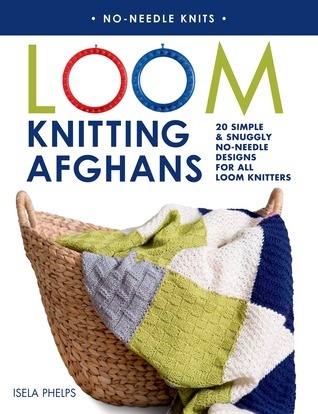 Popular loom knitting maven Isela Phelps is back with a new book containing patterns for afghans, blankets, and throws. Whether you’re new to loom knitting or a serial afghan knitter looking for some new exciting projects, this book has lots to delve into, from blankets featuring graphic chevron patterns or a variety of stitches and textures, to easy patchwork throws or blankets showcasing intricate cables and lace patterns. As the projects are arranged from beginner to advanced, new loom knitters can progress through the designs while learning and mastering techniques along the way. Isela provides the clear, easy-to-follow instructions her books are known for, and shares hints and tips for how to choose the right loom and yarn for a project. An illustrated introductory chapter explains and demonstrates everything you need to know about loom knitting and serves as a great refresher course. A finishing section helps you achieve expert results and provides instructions for how to personalize your designs with a range of embellishments. Giveaway ends June 26, 2014. Can’t wait? Buy the book today! Have you tossed that toasty-warm comforter into storage yet? It’s getting pretty hot and humid for us here at SMP Craft, so all we really need on our beds now is a light, colorful afghan–one just like this gorgeous chevron throw! Which is great, because it’s this week’s Freebie Friday project from the newest book in Isela Phelps’s loom-knitting series: Loom Knitting Afghans. Whether you’re new to loom knitting or a serial afghan knitter looking for some new exciting projects, this book has lots to delve into, from blankets featuring graphic chevron patterns (like this one!) or a variety of stitches and textures, to easy patchwork throws or blankets showcasing intricate cables and lace patterns. As the projects are arranged from beginner to advanced, new loom knitters can progress through the designs while learning and mastering techniques along the way. Eager for more? Buy the book today! It’s that time again! We couldn’t be more excited to introduce another fantastic loom knitting book from Isela Phelps, this time with twenty great new patterns for those colorful accessories you curl up with while reading a good book. Introducing: Loom Knitting Afghans. Whether you’re new to loom knitting or a serial afghan knitter looking for some new exciting projects, this book has lots to delve into, from blankets featuring graphic chevron patterns or a variety of stitches and textures, to easy patchwork throws or blankets showcasing intricate cables and lace patterns. Isela provides the clear, easy-to-follow instructions her books are known for, and shares hints and tips for how to choose the right loom and yarn for a project. An illustrated introductory chapter explains and demonstrates everything you need to know about loom knitting and serves as a great refresher course. And a finishing section helps you achieve expert results and provides instructions for how to personalize your designs with a range of embellishments.